Published by Shinchosha Publishing and Vertical Inc.
“I found a word to express my feelings. Right now… I feel forlorn.” – Yozo Oba, No Longer Human. When I first wrote about my personal excitement over Vertical’s licenses early this year, of the lot, No Longer Human was closer to a curious acquisition rather than a something that I was truly excited for. Blame it all on my Japanese literature teacher who loved Sonezaki suicides and Haruki Murakami more than this work of Osamu Dazai. Prior to this, I had not heard of Ningen Shikaku. When Ed Chavez told me about how this was one pivotal title that should be read in Japanese literature (and was his personal favorite), I didn’t understand the gravity or the weight of those words but only knew that if this was a manga adaptation of my master’s favorite novel, then it’s definitely something worth looking at. I was very fortunate that when I reserved the book the other day in our local bookstore, the book was immediately sent to me yesterday. I don’t know if I was fortunate, or unfortunate, to have received this book so soon. In fact, since I read the book during my cigarette break, I’ve been feeling emotionally catatonic. 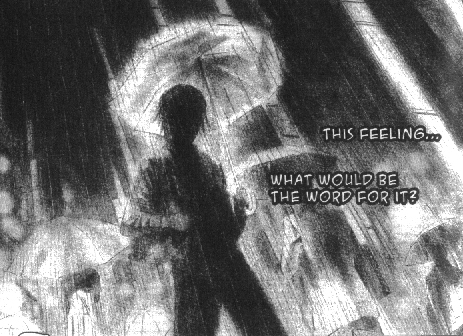 Not even the cheeriest BL, shoujo, or shounen manga could stir my emotions. Even Yoshihiro Tatsumi’s A Drifting Life, which I read after, was pale in comparison to the emotional weight of this manga. Never have I read a manga who made me understand and feel what it meant to be no longer human. Furuya’s No Longer Human is an adaptation of Osamu Dazai’s classic of the same title. I feel ashamed that I really haven’t read much of the book and was midway through it when I started reading the manga, but perhaps it was a good thing that I have started reading the novel because I probably wouldn’t appreciate the masterful adaptation of the novel in the modern world. The anonymous narrator in the start novel has now transformed to Usamaru Furuya who was probably browsing through 2ch or some Japanese board and saw a link to what has been translated as “Ouch Blog.1” This probably comes from the word itai blog which literally does mean “ouch” blog but the word itai has been transformed in 2ch lingo as a word for someone who is a headache, an annoyance, a pain in the neck. It has also been used to refer to people who tend to self-deprecate online through blogs. They’re often referred to as itai hito (痛い人). These people and their blogs eventually become the center of scrutiny or humor from various internet folks. I suppose the line “I got depressed reading it. But I can’t stop reading it” was irresistable to Furuya. His masochistic curiosity eventually showed him three pictures of Yozo Oba, the itai otoko. The first was in his youth where he smiled like a creepy child in those horror flicks. The second photo showed a cunning young man, sitting quite charmingly in a wicker chair. The last is the face of a tired person and even with a caption of “Age 25,” Furuya called him an old man. The first line of his story was “I’ve lived a life full of shame.” And much like that poster in 2ch, Furuya couldn’t stop reading. Yozo Oba turns out to be this fascinating young man who pretty much had everything in his life but somehow felt that his life was not his own and the world that he lived in felt unreal. This is probably not the first time we have encountered such a character and in shounen manga, this would have been the start of the protagonist’s search for his identity and his bright future. But things were not bright and unlike others, Oba had no intention of making things any brighter for them. He put on a cheerful face but it was merely a mask of his own fear of people. He turned to cigarettes, smokes, alcohol, and prostitutes to feel at ease with his suffering yet even then, he still felt afraid. The strange thing was as a reader, personally, I have this notion of judging delinquents with little or absolutely no sympathy for them. There’s little left to be desired of Oba but what was strange was that you actually understand what he was going through. When Furuya changes his style from his clear vivid lines to his charcoal images, you begin to see Oba’s world and you come to understand the darkness he sees. The questions he raised on the meaning of ordinary, proper, more were things that all of us have personally debated with. What did best entail? What is past ‘more happy’? You learn to sympathize with Oba’s struggles with the standards that society has placed — on how these were not truly liberating but one that can constrict those who find it hard to understand what it meant to be a human being. As the pages blur to illustrate Oba’s emotions, you also feel your world blur, as if doubting in the same way that he’s doubting. The world becomes a terrifying place. I rarely write a review of a manga without having read the entirety of the set. This is, perhaps, one of the few exceptions I’m making because I believe, while it’s still fresh off the printers, this is a manga that is definitely worth having in your shelves. I have read Furuya before with Jisatsu Circle (Suicide Circle). That too was a story of great emotional weight with some twist and turns in between but it didn’t have the same impact as this. 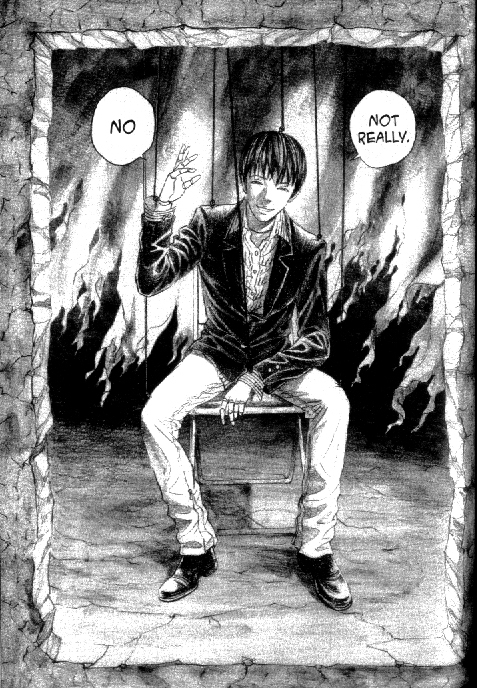 I believe the years in between Jisatsu Circle and No Longer Human, Furuya’s style has managed to capture the meaning of darkness and how it translates to reality. What I feared with No Longer Human was that it would be like Genkaku Picasso or Lychee Light Club where Furuya dabbled heavily with grotesque images. I’m not completely against that. In fact, I believe, that Furuya’s one of the few mangaka who probably manages to translate grotesque in the same brilliant manner as Umezu did in his day. But Furuya didn’t exactly follow after that style with No Longer Human. Not with this volume at least. There may be some who might find some of the blurred images quite frightening but I personally feel that the shifts Furuya used in his style, the lightness of his regular style to the blurred darkness of his charoal sketches, heightened the polarity of Oba’s world view. It was beautiful and frightening in it’s organic inconsistency. I personally loved how the softness of the charcoal sketches draws you in flawlessly, like as if sinking into Oba’s dark sea. It makes his paranoia real and natural. It’s only in this style that I believe that rather than lighting the subject, darkening Oba was the best way to highlight his story. For a first volume, it was beautiful and I loved it dearly to feel the need to write this. And how I wished it had garnered enough attention in Japan for it to merit some kind of award because personally, I felt Furuya deserved it. But I would probably have to wait for the next few volumes to really understand the entirety of Oba’s world and Furuya’s storytelling. Until then, I am mesmerized by his darkness. A man in twitter had said to me that if I was expecting a bottom, I’ll probably fall into the darkness with No Longer Human. If darkness made me understand the other side of humanity, then I don’t mind sinking deeper.